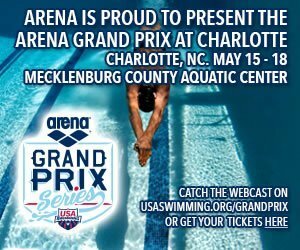 This morning we take you back to Charlotte for the prelims of the 200 butterfly, 50 freestyle, 100 backstroke, 400 freestyle, 200 breaststroke, 50 butterfly. Katinka Hosszu, a double winner yesterday (200 free, 400IM) is the favorite to win the women’s 200 butterfly and 100 backstroke. The iron woman of swimming’s range of events is comparable to the range of Michael Phelps; she can get it done in almost any event. Tom Luchsinger filled the void of Phelps on the international stage last summer on the world championships roster alongside Tyler Clary. The same two are the top seeded individuals for todays event, but don’t be surprised if some of the younger kids creep there way into the final heat tonight. 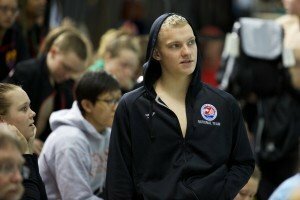 Dylan Bosch broke Phelps’ 200 SCY butterfly US Open record at the NCAA Championships, and was in the finals of the 1oo butterfly. Joseph Schooling and Andrew Seliskar have also had phenomenal seasons leading up to this meet. Jessica Hardy won both the 50 and 100 breaststrokes last night, and comes back today as the top seed in the women’s 50 freestyle. Ariana Vanderpool-Wallace, Madison Kennedy, Megan Romano, Ivy Martin, Kait Flederbach, and Amanda Weir are expected to be in the hunt as well. Anthony Ervin and Bruno Fratus are both seeded with 21.4. Bruno Fratus swum his seed time at the Maria Lenk Trophy meet, and is ranked 2nd in the world. Ervin’s best time this season is 22.48. Kristian Gkolomeev is another name to watch. He was the NCAA Champion in the 50 freestyle this march. Hosszu is the top seed and is currently ranked seventh in the world this year in the women’s 100 backstroke with a time of 59.98. She will try to hold off Megan Romano and the young Kathleen Baker. Fernanda Gonzalez is one to keep an eye on. She won the same event at the 2014 Mesa Grand Prix. The men’s 100 backstroke will be one of the most competitive events of the day. Nick Thoman, David Plummer, Arkady Vyatchanin, Eugene Godsoe, Junya Koga, and Albert Subirats are all seeded towards the top of the psych sheet. Koga won the 50 backstroke last night with a time of 25.00. Also in this event is the NCAA runner-up, Shane Ryan, and the 2013 NCAA Champion in the 200 backstroke, Drew TeDuits. Allison Schmitt is the top seed in the women’s 400 freestyle. She looked good in the 200 freestyle in Mesa, and historically is a better 400 swimmer. Lotte Friis, her training partner at NBAC, is hungry for another win, however. Thursday night she picked up her first Grand Prix victory in the 1500m freestyle, after finished second to Ledecky in every other Grand Prix this season. Chloe Sutton, Gillian Ryan, Leah Smith, and Katinka Hosszu should also be competitive and make it harder to get locked into that A-final. Club Wolverines’s Connor Jaeger will have to hold off the powerful group of 400 freestylers. Conor Dwyer and Matt McLean finished 1-2 in the 200 freestyle yesterday. Michael Klueh is seeded in the top 8, and will have more back half speed as he is primarily a distance swimmer. The women’s 200 breaststroke will be a fun battle between Laura Sogar, Micah Lawrence, and Emma Reaney. Emma Reaney broke the American record in the 200 SCY breaststroke twice during the NCAA Championship season. Cody Miller holds the top time for the men’s 200 breaststroke. Behind him is Thomas Dhalia, the 2014 French National champion in this event. 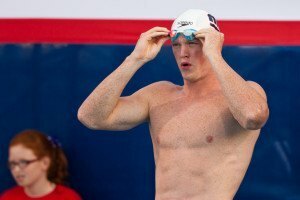 Although he is seeded second, he was fully tapered for French Nationals and most likely won’t be as fast today. The two to watch are going to be Mike Alexanderov and Chase Kalisz. Kalisz won the 400 IM last night, powering past Tyler Clary during the breaststroke leg, and Alezanderov won both the 50 and 100 breaststroke last night. The final individual events of the day are the men’s and women’s 50 butterfly. The swimmers are seeded with their 100 times, and if you follow the 100 butterfly results, we should expect to see Katarine Savard and Claire Donahue towards the front. They had the fastest 50 splits in the field. You always have to watch out for the sprinters in the stroke 50 races. A lot of these swimmers are not as competitive in the 100 or 200, but have enough speed to bust through a 50. Tim Phillips and Pavel Sankovich had the fastest 50 splits in the 100 butterfly yesterday, outside of Michael Phelps, who isn’t entered into this event today. As expected, Katinka Hosszu qualifies as the top seed in the women’s 200 butterfly; she usually attacks prelims hard. Hosszu’s time was 2:11.94. Emily Nunn threw up a 2:12.88 to qualify second. Megan Kingsley, Kate Mills, Becca Mann, Courtney Weaver, Meredith Hoover, and Andreina Pinto round out the A-final qualifiers. 2:14.23 was the 8th place time from Pinto. Katarine Savard (2:14.55) and Camille Adams (2:14.60) just missed the A-final, and will be in the middle of the pool for the B-final tonight pending any scratches. Joining those two will be Kaitlin Pawlowicz, Tanja Kylliainen, Laura Harrington, Easop Lee, Madison Homovich, and Elizabeth Beisel with the 16th place time of 2:17.06. Dylan Bosch is the top qualifier for tonight in the men’s 200 butterfly with a time of 2:00.21. Andrew Seliskar, the 17 year old, was just behind Bosch with a time of 2:00.51. Luchsinger was six seconds off of his time from last summer to qualify third and should have more in the tank for tonight. Benjamin Colley, Chase Kalisz, Joseph Schooling, Steve Schmuhl, and Mick Literland round out the top 8 with Litherland’s 8th place time of 2:02.08. Sebastian Rosseau, Omar Pinzon, and Thiago Pereira were all under 2:03, and will be the favorites in tonight’s B-final. Joining that group will be Nico Van Duijn, Ben Southern, Yeziel Morales, Kevin Litherland, and Peter Brumm with Brumm’s 16th place time of 2:04.73. Madison Kennedy and Ivy Martin tie for the top seed in the women’s 50 freestyle with their times of 25.68. Amanda Weir, Jessica Hardy, Rebecca Guy, and Faith Johnson were all under 26 seconds. Katie Meili and Megan Romano rounded out the A-final with Romano’s 8th place time of 26.18. Just missing the A-final of the women’s 50 freestyle was Kelsi Hall and Jessica Lloyd. The two tied for ninth at 26.24. The rest of the B-final was very close; within .3 seconds. Nora McCullagh, Caroline Simmons, Sveta Shakhlova, Michelle Williams, Maddy Frost, and Natalie Labonge round out the B-final with Labonge’s 16th place time of 26.55. 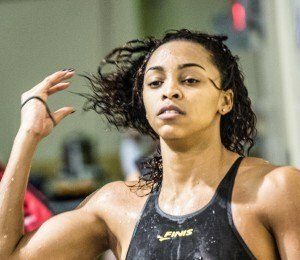 **Ariana Vanderpool-Wallace missed her race during the A-flight and is now set to race in heat 17 of the B-flight. Although most B flight swims are not expected to final, any swim during the B flight counts and will earn a spot in finals if fast enough. If she can break into the finals, things could be shifted around a little bit. Bruno Fratus snagged the fastest time of the morning with a 22.60 in the men’s 50 freestyle. Josh Schneider, Kristian Gkolomeev, Anthony Ervin, and Roy Burch were the only other sprinters to get under 23. Cullen Jones and Miguel Ortiz are also safely in the A-final. There was a tie for 8th place between Bruno Ortiz and Bradley Deborde at 23.37 that will require a swim off unless there is a scratch. Mark Weber finished 10th, only .01 seconds behind the 8th place tie. Weber (23.38), Paul Powers (23.39), Matt McGinnis (23.40), and Yuri Kisil (23.41) were all only .01 apart from each other. James Peek qualified in 14th at 23.55, followed by Kyle Darmody and Mario Todorovic. Todorovic qualified with the 16th place time of 23.67. **Bruno Ortiz won the swim off, earning the final spot in the A-final, dropping to a 22.75. Brad Deborde will be the ninth seed, swimming in lane 4 for the B-final. Katinka Hosszu locks down her second race of the day and will now be in the middle of the pool for finals in the 200 butterfly and this event. She posted the fastest time of the morning with a 59.94. Prior to today, she was tied for seventh in the world this year at 59.98. Her prelims time of 59.94 will move her into seventh in the world by herself. Ali Deloof was the only other swimmer under 1:02, with a time of 1:01.24. Kathleen Baker, Caroline Colorado, Megan Romano, Ellen Williamson, and Kennedy Goss are all in the 1:02 range. Marie-Pier Couillard qualified for the A-final in the 8th place spot, touching the wall with a time of 1:03.15. Hellen Moffitt will sit in the middle of the pool for the B-final, pending any scratches, with a time of 1:03.28. Isabella Arcila, Fernanda Gonzalez, Zoe Mattingly, Kaitlyn Jones, Yin Yin Lau, Brooke Zeiger, and Emily Meilus round out the B-final with Meilus’ 16th place time of 1:04.21. David Plummer threw down a 54.70 to earn the top qualifying spot in the men’s 100 backstroke. Arkady Vyatchanin, Charlie Boldison , James Wells, Junya Koga, and Pavel Sankovich were all in the 55 second range. Omar Pinzon finished seventh, followed by Eugene Godsoe with the 8th place qualifying time of 56.13. Shane Ryan was just out of A-final range, posting the 9th place time of 56.33. Albert Subirats, Drew teDuits, Jonathan Carlisle, Pedro Oliverira, Corey Main, and Connor Green rounded out the B-final, with Green’s 16th place time of 57.36. Katinka Hosszu!!! After winning two events yesterday, she has now managed to qualify in the top spot in three different races; 200 butterfly, 100 backstroke, and now the 400 freestyle! She was the only swimmer under 4:11 this morning, with a time of 4:10.56. Leah Smith qualified second with a time of 4:11.01. North Baltimore took control of the final heat, qualifying their swimmers 3rd through 7th. Gillian Ryan, Becca Mann, Cierra Runge, Allsion Schmitt, and Lotte Friis were all 4:11’s and 4:12’s. Chloe Sutton grabbed the last spot in the A-final with her 8th place time of 4:13.01. Lindsay Vrooman will be in the middle of the pool for tonight’s B-final. She qualified 9th with a time of 4:16.05. Andreina Pinto, Ashley Steenvoorden, Hannah Moore, Elizabeth Beisel, Vien Nguyen, Sam Cheverton, and Jessica Thielmann will be rounding out the B-final heat of the women’s 400 freestyle. Thielmann’s 16th place time was 4:18.75. Club Wolverine situated themselves in the middle of the pool for tonights finals. Michael Klueh grabbed the top seed with a time of 3:55.06, followed by Anders Nielsen at 3:56.71 and Sean Ryan at 3:57.45. Conor Dwyer, Evan Pinion, Matt McLean, Mitch D’Arrigo, and Jay Litherland will be joining them in the A-final, with Litherland’s 8th place time of 4:00.75. Justin Glanda is the ninth qualifier, and will find himself in lane 4 in the B-final of the men’s 400 freestyle with a 4:02.42. Cameron Stitt and Liam Egan finished 10th and 11th, both coming in with 4:02’s. Dan Wallace, David Herron, Alec Cohen, Clark Smith, and Christian Bayo round out the B-final with Bayo’s 8th place time of 4:o4.81. Micah Lawrence claimed the top time of the morning with a 2:29.02 in the women’s 200 breaststroke. Molly Hannis and Melanie Margalis were 2nd and 3rd at 2:31’s. Emily McClellan, Annie Zhu, Lilly King, Katie Meili, and Gretchen Jaques will round out the A-final with Jaques’ 8th place time of 2:35.47. Annie Lazor swum the ninth fastest time of the morning, 2:35.76, to swim in lane 4 in the B-final tonight. Miranda Tucker was the only other swimmer under 2:36 with a 2:35.94. Raminta Dvariskyte, Lauren James, Maija Roses, Abigail Fisher, Madisyn Cox and Amanda Lawson round out the B-final with Lawson’s 16th place time of 2:38.04. Two of the favorites, Laura Sogar and Emma Reaney, were no-shows for this event. Anton McKee qualifies with the top time of the morning in the men’s 200 breaststroke at 2:14.66. Chase Kalisz and Lewis Coleman were 2nd and 3rd with 2:15’s. Cody Miller was 4th at 2:16 while Mike Alexanderov and Thomas Dahlia were at 2:17’s. Brendan McHugh and Matthew Ackman round out the A-final with Ackman’s 8th place time of 2:20.03. Carlos Almeida earned the top spot in the B-final of the men’s 200 breaststroke with a time of 2:22.30. Ross Palazzo, Brad Craig, Gabriel deSousa, Tristan Slater, Matt McNamara, Paul Corbae, and Tynan Stewart round out the B-final with Stewart’s 16th place time of 2:22.34. After missing her 50 freestyle, Ariana Vanderpool-Wallace earned the top seed in the women’s 50 butterfly with a time of 26.47. Kristel Vourna was second at 26.73 and Claire Donahue was third at 26.76. Kelsi Worrell, Katerine Savard, Sveta Khakhlova, Ivy Martin and Caroline Colorado round out the A-final with Colorado’s 8th place time of 27.45. Aliena Schmidtke posted a time of 27.65 to earn the top spot in the B-final of the women’s 50 butterfly. Jesscia Lloyd, Elsa Welshofer, Emma Ball, Michelle Williams, Faith Johnson, Courtney Weaver, and Zoe Mattingly round out the b-final with Mattingly’s B-final time of 28.11. Kristian Gkolomeev earned the top seed in the men’s 50 butterfly. He posted the top time of 24.04, just ahead of Joseph Schooling’s 24.15. Albert Subirats, Pavel Sankovich, Tim Phillips, Eugene Godsoe, Cullen Jones, and Michael Andrew will round out the A-final of the men’s 50 butterfly with Andrew’s 8th place time of 24.52. Mario Todorovic will be the top seeded swimmer in the B-final of the men’s 50 butterfly with a 24.58. Mathhew Josa, Sean Fletcher, Mark Weber, Soeren Dahl, Miguel Ortiz, Elvis Burrows, and Patrick Park round out the B-final with Park’s 16th place time of 25.07. Clary scratched 200 fly? Interesting. Apparently he won’t be in any races today as he will be in a triathlon. Priorities when you get to hang out with Jimmie Johnson and do his swim portion what else. To be with one of the top NASCAR drivers what a kick. These swimmers only go around once and there are other meets. Go Tyler. Cullen Jones has made it into both the 50 free A final and the 50 fly A final tonight. Good for him. Good to see Anthony Ervin, Josh Scneider and Roy Burch in the 50 free A final tonight too. It should be some good swimming tonight. Woah, looks like Ali Khallafalla sneaks into the 50 free A final from the B flight. He won the VISAA 50 and 100 free this year. Haven’t heard if/where he’s swimming in college. He actually committed to Indiana, should be exciting to see how develops in a program not known for sprinters.